Spain has fallen from sixth place in 2016 to ninth place in this year’s annual “Rainbow Europe” LGBT-rights index, issued by the Brussels-based International Lesbian, Gay, Bisexual, Trans and Intersex Association (ILGA), a non-governmental organization that monitors acceptance of LGBT communities throughout Europe. After having moved up one position last year in the ranking among 49 European countries, the non-governmental organization says that although Spain remains among the top 10 countries in terms of acceptance of LGBT communities, the country nevertheless fell from an overall acceptance ranking of 70 percent last year to 67 percent this year. 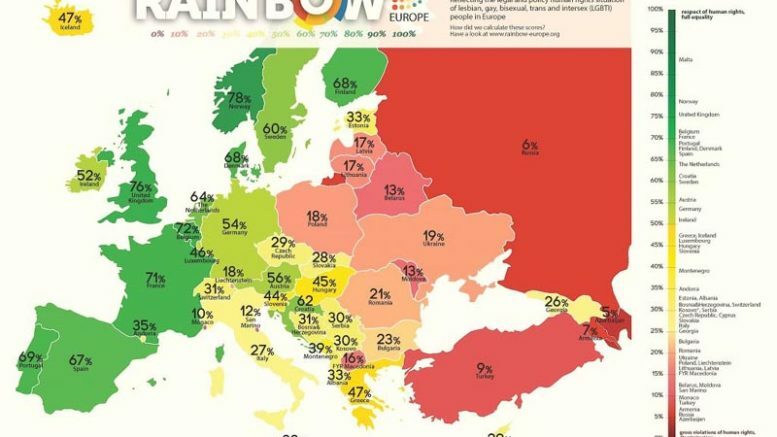 The annual Rainbow Europe report attributed the less-favorable ranking this year to a worrisome confluence of an increase in reported physical assault, discrimination and hate speech directed against Spain’s LGBT community. On the latter, the report cited increasing denunciations of the LGBT community and in particular transgender rights by Catholic church officials and groups, in attacking what Catholic groups have termed “gender ideology” and campaigning to block course material about LGBT rights included in the curriculum for students in government-subsidized Catholic schools in Spain.